Tatsuya is the protagonist of Persona 2 (part of the Persona series). In the game he can choose to date one of four NPCs: two men and two women. With one male character (Eikichi), nothing happens. 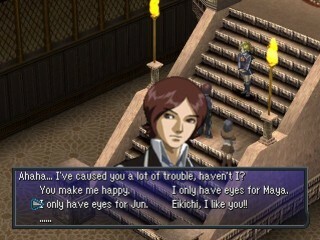 The other male character, Jun, is Tatsuya’s childhood friend and their relationship is treated no differently than the two female character options. Given that the character also appears to be openly bisexual throughout the game, this seems to be more than just a relationship option. This entry was posted in 1990s, Bisexual, Bisexual (explicit), Optional Relationship, Playable Character, Queer Men on August 27, 2015 by Adrienne Shaw.